also see Tait Bros, Hokitika. The Rev. William Eugene Gillam was John Tait's brother-in-law. John Tait was the son of George Tait and Anne Tait nee Mowatt. He emigrated to Victoria, Australia with his family on the ship "Priam" arriving in August 1852, he was then aged about 15 years. 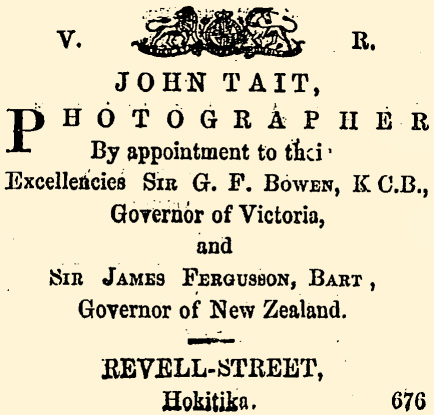 He came to New Zealand about 1864 and set up the photographic studio known as the Caledonian Portrait Rooms in Princess Street, Dunedin with his younger brother Alexander Tait. 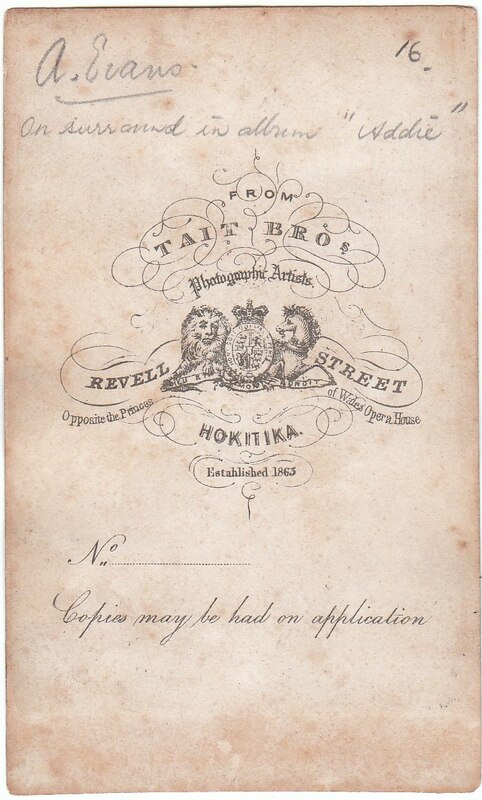 The business was later known as Tait Bros.
Mr. John Tait, J. P., was Mayor of Hokitika in the year 1885–86. He was first elected as a member of the Borough Council of Hokitika in 1869, and served for a number of years. 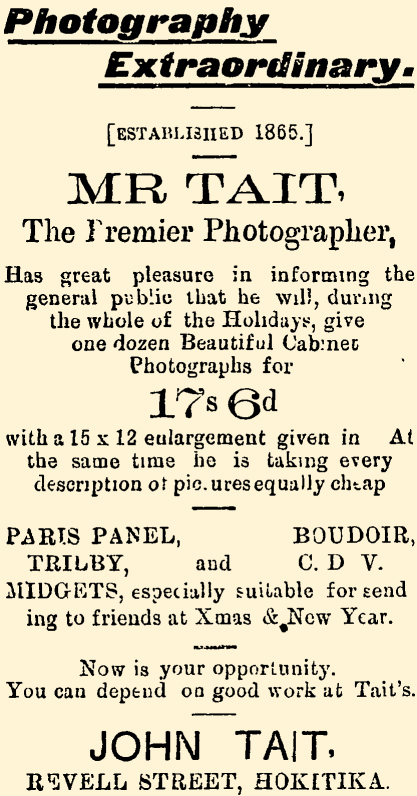 Mr. Tait is well known in Hokitika as the local photographer. He is a trustee of the Hokitika Benevolent Society, and of the Westland Hospital, and a member of the Licensing Committee. He was one of fifty gentlemen who attended a levee held at the Supreme Court House, Hokitika during the visit in 1871 of the Governor, Sir George Ferguson Bowen. Tait, John, 1836-1907. Otira Gorge Hotel. Original photographic prints and postcards from the file print collection, Box 18. Ref: PAColl-7581-77. Class 415— Photographs of Westland scenery, glaciers, snow-clad hills, Hokitika Local Committee; photographs, John Tait, Hokitika. Mr Button's lime light entertainment at the Wesleyan Church last evening, was a decided success. There was a crowded attendance, and the pictures were shown with great skill. The Rev. Mr Smith read the descriptions of the views shown, including a scene from Childe Harold, photographed by Mr John Tait. Mr Button is to be congratulated on the success of his panorama. Our fellow townsman, Mr John Tait, photographer, of Revell street, has produced an excellent selection of views and works of photographic art, which he is sending on on this occasion to the Melbourne exhibition. We have no hesitation in saying that they are some of the best finished pictures that have ever been taken on the Coast. The Wallace Bridge," at the Otira, is certainly a gem "Lake Lonely," Arthur's Pass, 3000 ft above the level of the sea, is also an imposing picture, conveying a truthful sense of the inhospitable region in which it exists. Crawford's sluicing claim, Dillman's Town, is a busy scene of one of the best paying claims on the goldfleld. Two views of Revell street, Hokitika, are well and happily chosen. There are several other very interesting scenes of equal merit. As a study "My Pets" is certainly a splendid production, there is also a highly finished photograph of the late lamented John Lazar. 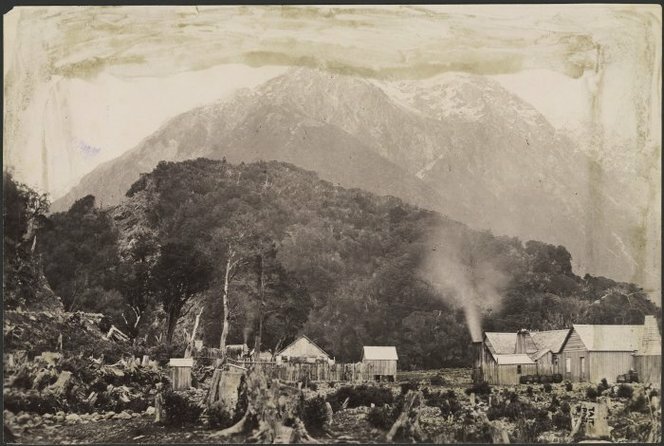 Amongst the miscellaneous exhibits for the Court may be mentioned the photographs of West Coast scenery sent by the Hokitika Local Committee also some beautiful photographs of scenery by Mr Hanwell Williams, and by Mr W. H. Perkins, both of Greymouth. Mr John Tait, of Hokitika, sends an admirable large size photo likeness of the late Mr John Lazar, recognised here by many Victorians who were acquainted with the worthy original in "auld lang syne," the same artist also contributes a large frame of well-executed photographs, which are remarkable for their clearness. 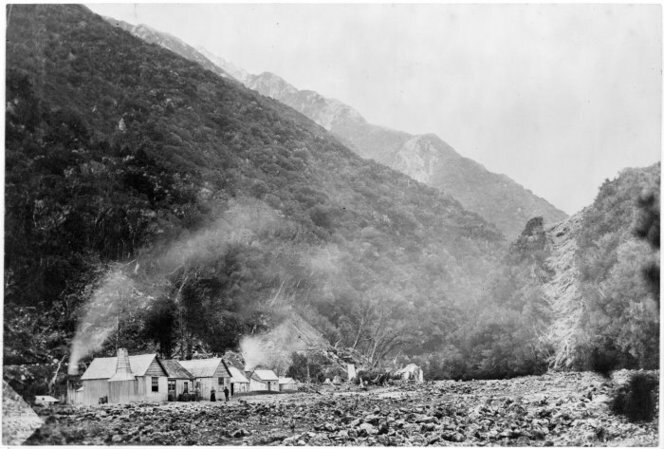 Scene in the Otira Gorge , West Coast, circa 1870. Shows the Otira Gorge Hotel with a bush clad hill, and mountains, beyond. Photograph taken by Tait, possibly John Tait. We are glad to learn that Mr John Tait, who has been seriously ill for the last day or two, is now improving in health. Mr John Tait announces that urgent private business which will probably require his absence from Hokitika precludes the possibility of his contesting the Mayoral election. The photographic art has of late year taken such strides that the older and more laborious processes have become extinct, and are now succeeded by others which have completely revolutionised the art. Mr John Tait, photographer, has recently added largely to his store of these improvements, and is now in a position to not only produce photographs of high artistic merits, but these at the lowest price. All other kinds of art work, such as coloring in oils, water colors and crayons are also undertaken and executed at the studio. Mr John Tait, the well-known photographer, has admitted into partnership Mr A. (Alexander) Ward, of Nelson, a recent arrival from the Old Country, who is said to be a most expert photographer, artist and retoucher. The new firm have our best wishes for their future success. The residence of Mr John Tait, Weld Street, had a narrow escape from destruction by fire a few nights ago. It seems that Mr Tait was sitting in the music room with Mrs and Miss Tait when he noticed smoke coming from the chimney as if there was some obstruction, or the wind had blown it down. This continued for some time but gradually the quantity decreased and when they retired it was scarceable noticeable. Before retiring Mr Tait went into the various rooms to see if everything was secure. He had removed his boots and when in the music room was surprised to find the stone hearth was hot whilst the smoke appeared to be again issuing from the chimney. He unsrewed the mantelpiece and found the volume of smoke had increased. He then obtained assistance from Mr W. A. Thompson and the hearth stone was removed when the flow plate underneath was discovered to be burning, the fire having gained a strong hold. It would not have taken much time before the fire got clear of the stone when it would have attacked the floor and before the family could be aroused the building would probably have been a mass of flames, if they were not suffocated and burnt to death. The escape was a most providential one. Had not Mr Tait by chance trod on the hot hearthstone the fire would not have been discovered until the building was in flames. The chimney had been constructed in a faulty manner, permitting the heat from the fire to communicate itself, to the wood work until it became like tinder. 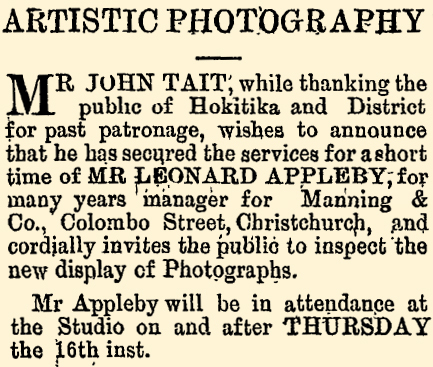 Mr Appleby, the eminent Christchurch photographic artist, who will remain here for a month under arrangement with Mr John Tait, has already made a show of artistic work which is worthy of inspection. 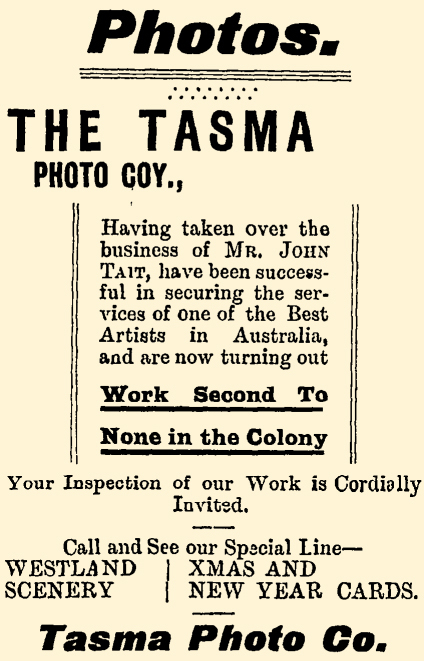 The Tasma Photographic Coy announce that they have taken over the business of Mr John Tait, and have secured the services of one of the leading photographers of Australia as manager. The Coy is making a specialty of black and white, and sepia toned prints, and requests the public to inspect their work, which is of the highest class. A very pretty Xmas card, consisting of eight views of typical West Coast scenery is being turned out at the company's studio. 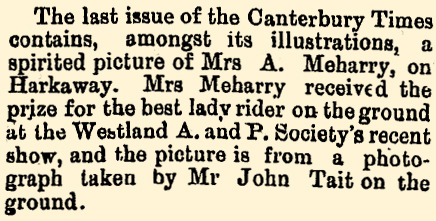 Mr. John Tait , J. P., was Mayor of Hokitika in the year 1885–86. He was first elected as a member of the Borough Council in 1869, and served for a number of years. 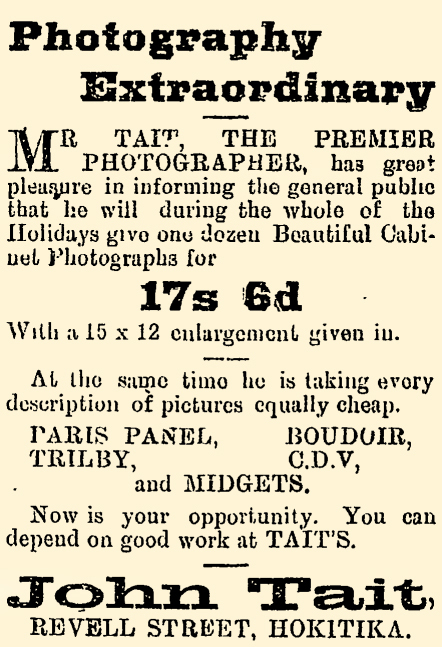 Mr. Tait is well known in Hokitika as the local photographer. He is a trustee of the Hokitika Benevolent Society, and of the Westland Hospital, and a member of the Licensing Committee. JOHN TAIT, ÆTAT 70 YEARS. Another link in the chain of worthy citizens connecting Hokitika's part and present who bore the brunt of the pioneer labours of the Coast, has been removed by the passing away of Mr John Tait, which occurred at his residence, Weld Street, last Friday morning. Some six months ago he retired from active management of his long-established photographic business in Revell Street, since when he has been in failing health, and his death was not unexpected. The late Mr Tait was born in Caithness, Scotland, in 1836, and on the 9th of next month would have reached the age of 71 years. With his parents, he came to Victoria while still very young, and received his education in Melbourne. He adopted the profession of chemist and druggist, and when fully qualified started in business in Portland, Victoria. Like so many others of the Coast's adventurous pioneers, he caught the gold fever, and came to Dunedin, where, seeing a business opportunity, he gave up thoughts of mining and started a photographic business there. Shortly afterwards, when the West Coast opened, Mr Tait came to Hokitika, 1865, and started business with his brother, under the style of Tait Bros., and he has resided here constantly ever since. The deceased gentleman always closely identified himself with the progress of the town, and took a very active part in public affairs. He was a member of the majority of our local bodies, serving at various times on the Borough Council, the Hospital Trustees, the School Commissioners, the Hospitals and Charitable Aid Board, and the Benevolent Society. He was elected to the Borough Council in 1869, and after serving for 17 years as Councillor, he was elected Mayor in 1886. In that year Sir William Jervois, the then Governor visited Hokitika and the citizens subsequently presented Mr Tait with a public testimonial in recognition of his service during his term of office. For many years he held the Commission of the Peace and he was also a very old member of the Masonic order, having been initiated in the Westland Kilwinning Lodge in September, 1867. The foregoing record of public service speaks for itself, though it does not tell of zealous discharge of the office held by Mr Tait, which he filled with the most faithful attention to the duties that were imposed on him. In both his public and private life the late Mr Tait's kindly, unaffected, sincere disposition endeared him to many friends and it is no mere conventionality to say that genuine regret for his demise will be widespread. He leaves a widow and niece (Mrs A. D. Macfarlane) to mourn their loss to whom we tender sincere sympathy in their bereavement. The funeral of the late Mr Tait took place at 8:00 (or 8:30) yesterday morning when there was a large attendance, a number of country residents being present. The Rev. H. S. Leach conducted the last sad rites at the church and the graveside. Messrs G. Perry, C. Malfr(ey) junr, Newman and Lamps acted as pallbearers. A large number of wreaths and floral emblems covered the coffin. At the conclusion of the service at the church the "Dead March in Saul” was played. At the conclusion of a special meeting of the Hospital Trustees, held last evening, the President (Mr J, J. Breeze) in the chair, Mr Clifton moved a resolution in reference to the death of their late colleague, Mr John Tait. He moved that a resolution be recorded on the minutes expressing their sense of the great loss the Board had sustained by the death of Mr Tait, and that a letter of condolence and sympathy be forwarded to Mrs Tait in her heavy bereavement. Speaking to the resolution Mr Clifton said that the Westland Hospital owed a great deal to their departed colleague. He was untiring in his devotion to its interests, on the advancement of which he was unsparing of his time and trouble. 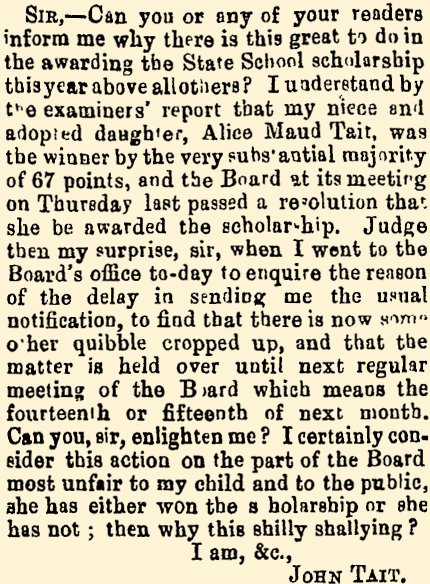 The President, in seconding the resolution, said that no one gave more time and conscientious attention to his duties as trustee of the Hospital than Mr Tait did, and his death would cause a vacancy on the Board which it would be hard to fill. The motion was supported by all the members and carried. A painful accident occurred on Tuesday evening to Mrs. J. Tait a well-known and highly-esteemed resident of Hokitika. It appears that Mrs. Tait was being wheeled in an invalid's chair to her home by her son-in-law, Mr. A. D. McFarlane, when, by some means the wheel struck an obstacle and the old lady was thrown heavily to the ground. Her injuries included a broken leg close the ankle. The services of Dr. Borrie were at once secured and it is gratifying to know that the sufferer is bearing up well, despite the fact that her injuries have occasioned her much pain. The largest head between the words "Tait" and "Bros" is from a Tait cabinet portrait of John Lazar. "In 1863 he moved to Dunedin where he became town clerk. Lazar could preach and assisted with worship on High Holydays in Dunedin. Ructions in the city council in 1866 led to the termination of all appointments and a reorganisation of staff. Lazar was not re-hired, perhaps bearing the brunt for one of his subordinates having misappropriated a sum of money. Lazar moved to Hokitika and became town clerk there instead. On the West Coast he continued his long association with freemasonry, in which he was a highly-regarded participant. The Lazar Lodge in Kumara was named in his honour. 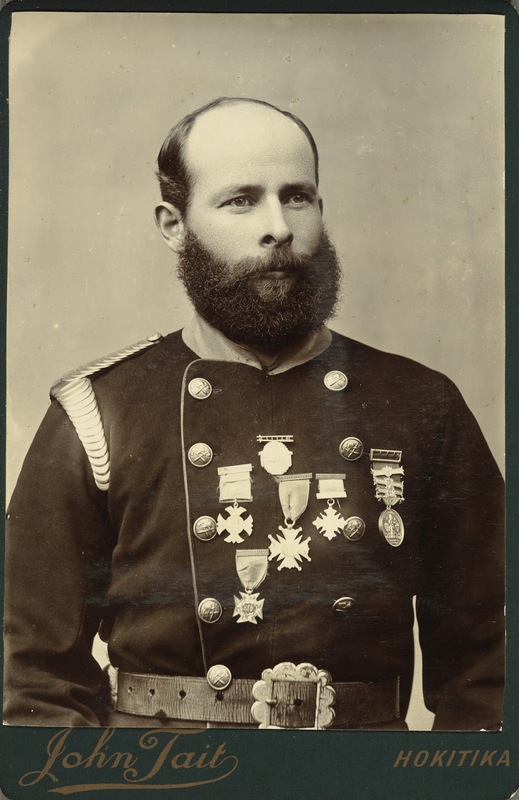 John Lazar died in Hokitika in 1879." The portrait can be found online if you do not already have it. Regards.